di Women in Business 17 Aprile 2019 8 min. 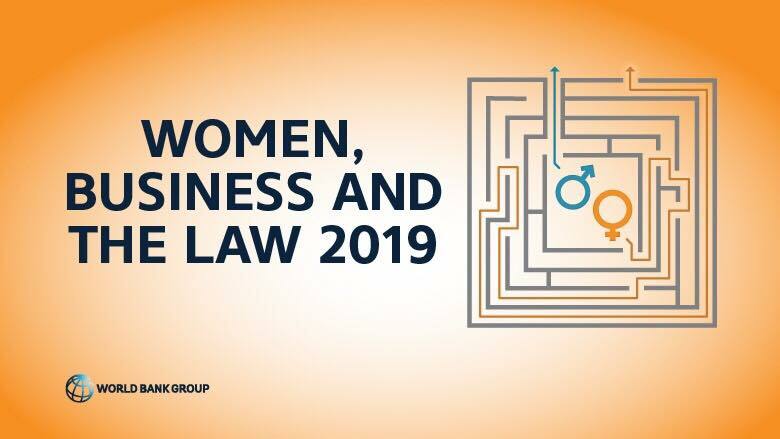 Women, Business and the Law 2019: New insights about women’s employment and entrepreneurship choices are presented. By the examination of ten years of Women, Business and the Law data, it has been shown that women are experiencing legal discrimination, in some countries significantly more than in others. These results gathered by the World Bank clearly demonstrate that gender mainstreaming is not reached yet. Over the last ten years the IBRD, a subgroup of the world bank, analyzed gender equality in almost every country of the world. Since 2009, Women Business and the law has improved the study of gender equality and initiated discussions on enhancing women’s economic possibilities and empowerment. After data collection, a ranking was established which shows how fair male and female inhabitants are treated in the participating states. For that ranking, 35 (especially economical) criteria were analyzed (see Figure 2). The criteria were related to the following categories: possibility of freedom of movement, starting a job, fair payment, marriage, children, running a business, asset management and retirement pension. Those were broken down into sub questions. For example, the possibility of men and women to choose freely where they live, if they can move and travel freely, if there are any laws against sexual harassment at work, if women can claim inheritance and ownership. Other examples are the opportunity for women to work in the same sectors as men, if women can file a divorce and remarry, if women can open bank accounts or sign contracts and if the age of pension is equal for women and men. Data on social, cultural factors or other issues, for example legal and safe abortion, were not gathered. – data shows that there are still countries where women are prohibited to work, to found a company or where they have no or hardly protection against sexual violence. Sadly, in 56 countries the legal framework has not changed at all over time. Overall, the global average came in at 74.14, which showed an increase of more than 4.5 points compared to 10 years ago. 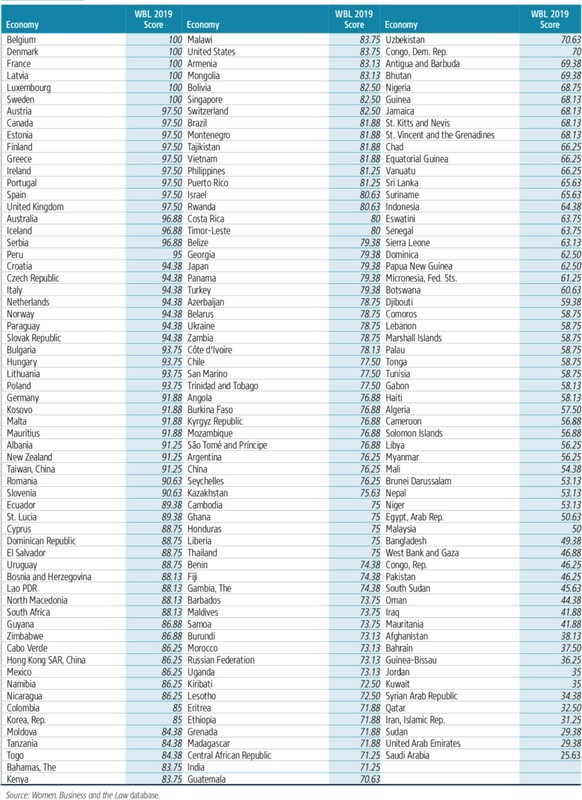 This score reveals that in the average country, women get just ¾ of the legal rights that men do. Nonetheless, the significant improvement over the past decade should not be ignored. Since 2009, 131 countries have introduced around 274 reforms, statues and provisions in order to move towards legal gender equality. In some countries legal equality has changed and improved to full legal gender equality: Women, Business and Law 2019 shows that six countries managed to score full marks of 100 points of gender equality. According to the world bank, these countries are Belgium, Denmark, France, Latvia, Luxemburg and Sweden, indicating that women are on equal legal standing with men during their working years. The biggest improvement was measured in France due to the implementation of laws against domestic violence, sexual harassment at workplace and the introduction of paid maternity leave. The report reveals that South Asia, East Asia and Sub-Saharan Africa show the biggest positive development compared to ten years ago. The Democratic Republic of Congo improved the most from an index of 42.5 in 2009 to an index of 70 in 2019. This positive trend was a result of the passing of a bill that women have to be obedient to their husbands and the implementation of reforms that allow women to work, register a business, open bank accounts, sign agreements and freely choose their place to live. Despite the above mentioned positive development, some countries are still far behind. Therefore, the last places are not surprising: countries such as Saudi-Arabia, United Arab Emirates, Sudan, Iran and Qatar scored the worst on women’s rights. Saudi Arabia’s overall score amounts to only 25.63 and the other three mentioned countries also score below 35. Despite permitting women the right to drive in Saudi Arabia since last year, they still have to be accompanied by a man if they leave the house (see Figure 3 for all scores). This study is the most currently published, that points out advantages to countries which accomplish legal gender equality. According to a separate report from McKinsey Global institute, released in 2015, closing this gender gap in the workforce could lead to an addition of $28 trillion to the global gross domestic product.